Check out our Exclusive Promotion at Casino Adrenaline. We have partnered with Casino Adrenaline to bring you an awesome Exclusive offer. 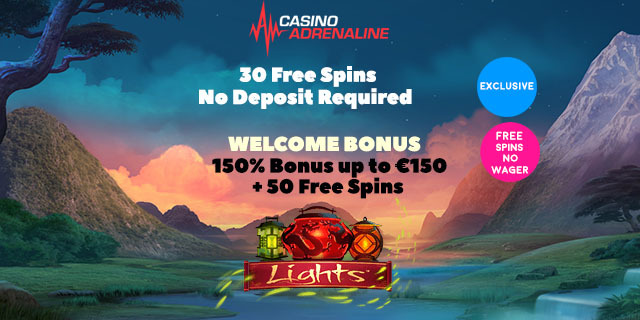 All new players can get 30 wager-free No Deposit free spins at Casino Adrenaline when they register as first time players. But wait, it doesn’t just end there – new players can also get a Welcome bonus of 150% up to £/€/$150 + 50 Free Spins. Check out the details below on how to get your No Deposit free spins and Exclusive Welcome bonus. 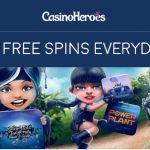 Exclusive Promotion at Casino Adrenaline: How do I get my 30 Real Money No Deposit Free Spins? Only new players at Casino Adrenaline are eligible to sign up for this promotion. Register for a Casino Adrenaline account using our Exclusive links on this page. 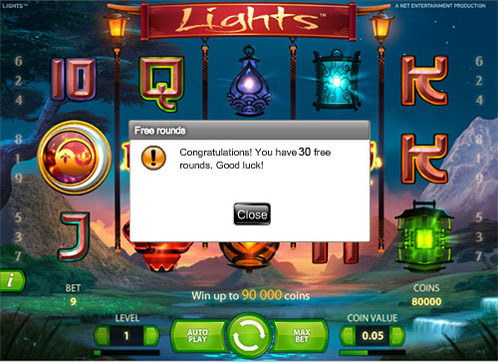 Once your account has been verified, log into your account and open up the Lights Slot to receive your 30 No Deposit free spins. ALL free spins carry no wagering requirements at Casino Adrenaline – that’s why they are called Real Money free spins. Essentially, whatever you win is yours to keep. Players can win up to £/€/$50 from this Exclusive No Deposit free spins offer. If you are a new player at Casino Adrenaline, then you are also eligible to claim the Exclusive First Deposit bonus offer of 150% up to £/€/$150 + 50 Starburst Free Spins when you make your first deposit. All Free Spins are wager-free at Casino Adrenaline. So simply spin, win, and withdraw! Note: In order to get your free spins, please contact the Support Team via Live Chat after your deposit has been made. The wagering requirement for the Welcome offer is 25x (deposit + bonus). Players from the following countries may NOT sign up for the No Deposit free spins offer, but may receive the Welcome offer: Poland, Russia, Ukraine, Slovakia, Romania, Lithuania, Latvia, Kazakhstan, Hungary, Estonia, Bulgaria, and Belarus. NEW MR SLOT APRIL OFFER! 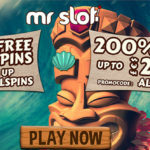 Get 50 No Deposit Free Spins on Aloha! 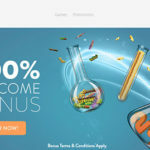 Cluster Pays + 200% bonus up to €/£/$200. Special bonus codes available NOW! 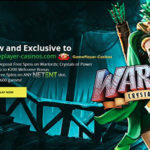 New CasinoHeroes Promotion: How about some Free Spins or a Hollywood VIP experience? Posted in Casino Adrenaline and tagged April offers, April promotions.